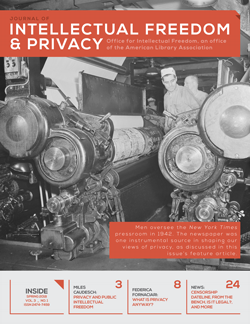 In May 2016, the Office for Intellectual Freedom began to publish the Journal of Intellectual Freedom and Privacy as the successor publication to the Newsletter on Intellectual Freedom. The new publication incorporates many of the features of the Newsletter on Intellectual Freedom, but adds new, substantive content. The journal now includes essays, peer-reviewed articles, book reviews, legal briefs, and opinion pieces. Readers can still read about the latest incidents of book banning in each issue, as well as the latest court rulings. legal controversies, and, of course, “success stories.” Our goal is to have the Journal of Intellectual Freedom and Privacy at the center of discourse on intellectual freedom and privacy issues in libraries. Submission information and author guidelines are available on the journal's website via this link. Submissions and inquiries can also be sent via email to Deborah Caldwell-Stone, managing editor, at dstone@ala.org. The full journal website can be accessed via this link. The inaugural issue of the Journal of Intellectual Freedom and Privacy is freely available online via this link. The journal is an all-digital, online publication available both in HTML and PDF. Our platform, Open Journal Systems, will provide subscribers with the option to download and print out a copy of the journal. You can directly access past issues of the Newsletter on Intellectual Freedom via this link. The subscription cost for the Journal of Intellectual Freedom and Privacy is $50.00 per year for individuals and $100.00 per year for institutions. Subscriptions are $35.00 a year for members of the ALA Intellectual Freedom Roundtable and the Freedom to Read Foundation. Those subscribers still owed issues of the Newsletter on Intellectual Freedom will receive their full subscription, with the Journal of Intellectual Freedom and Privacy in place of the Newsletter on Intellectual Freedom. For multiple subscriptions to the same address, subscription inquiries, and for back issues, please contact the Office for Intellectual Freedom at 800-545-2433, x4223 or oif@ala.org. Subscribe to the Journal of Intellectual Freedom and Privacy online via this link. Be sure to include your name, mailing address, and e-mail address (required and used only for the express purpose of accessing the online site). Please make your check payable to the American Library Association.